*Usual warnings apply as this post includes some details of butchery. So Saturday was D-day for our second Berkshire; second born and raised here at least. The other we prepared as a spit pig for St. David’s day back in March. We actually worked out the other day that this was the seventh pig we have killed and processed for ourselves. Some were born and raised here. Our first was purchased from a local breeder as a kill pig. [He was supposed to go straight to the butchers, but they closed in the mean time… but that’s a whole other story]. And we have assisted friends with a few other than that along the way. So I guess you could say we have processed a few and hopefully we're getting the hang of it! Well I say we, Matt and friend did all the hard work. I had minimal involvement on this occasion- not really meant to be lifting, stretching etc. And until our cold room is up and running (yes it will happen one day!) we are still relying on the kindness of friends to use theirs. So we are not planning any hams or bacons (as this requires weeks/months of use). But one day we will expand our processing to involve these too. But for now it does mean that the processing itself was reasonably quick. I have gone over the process of home butchering a pig before, so there are more in depth posts on here http://www.maes-y-delyn.com/2013/03/streaky-became-pork_26.html (again she was a little on the large side... in fact bigger than this one). We kill our pigs onsite (to minimise stress) and then transfer to the shed (and in front usually) to process. To be honest we had under estimated how big this little guy was. As compared to our breeding pair he still appeared small. But we do not tend to notice how big our breeds are now, as we have had them since young and don’t notice their growth creeping along. So we were surprised as he barely fitted in the bath tub! 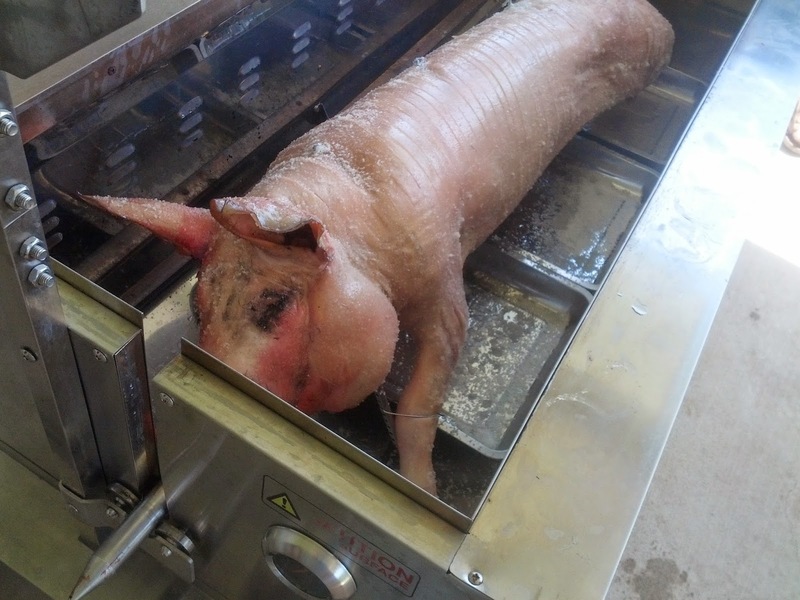 The bath tub is used to scold the pig to make removing the hair as easy as possible. The temperature of the water is ideally 64°cand you have to act quickly. As you want to agitate the skins surface as much as possible without it beginning to cook the meat. Most of the hair will come away with the blade of a spade or scrapers. But anything left, as in this case due to his size he almost filled the bath; making moving the water etc very difficult. Meaning we had to finish with shaving the carcass. Not such a neat finish for the meat. We have also been questioned in the past as to whether our pigs are the same animals as those pictured in latter stages. As the Berkshire breed is ‘black’, a common misconception. Especially as the literal translation of the Japanese name being ‘Black pig’. When they are in fact still white skinned, just predominantly black haired. Something that is of benefit to us given the severe affects the sun can have on pigs skin as much as humans. Making them ideal for free ranging in the Queensland climate. Once dehaired, the boys set about gutting and cleaning the carcass ready for hanging in the cold room. Again the unexpected size meant the jib used to work on the previous pig and goats was a little low and required adjustment. Now pigs do not require the hanging time of other animals (cows, deer etc). 24-48 hours is generally more than enough, prior to processing. So within a few days the cuts were bagged and tagged (an essential tip for home killed meats, or if you buy in bulk). Hopefully we still have enough freezer space for our half of the big girl in a couple more weeks.